Company: The LeGaye Law Firm P.C. 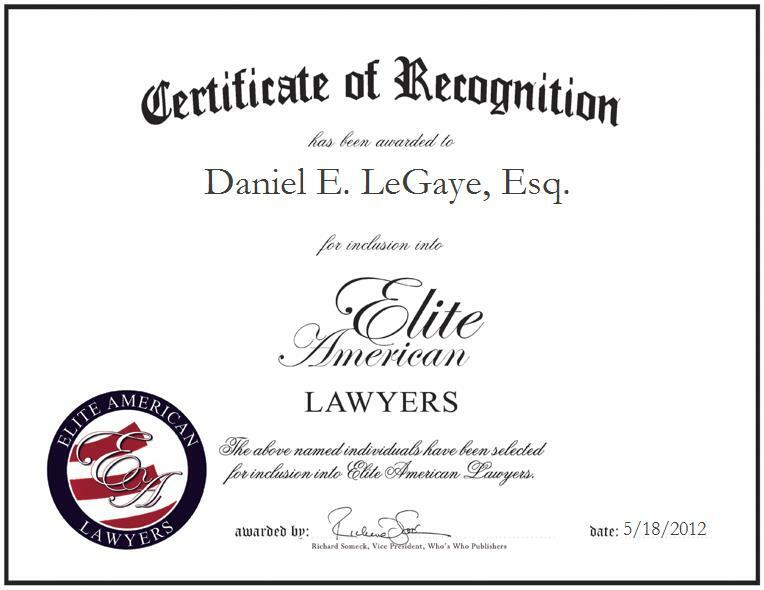 THE WOODLANDS, TX, May 18, 2012, Daniel E. LeGaye, Esq., Managing Partner of The LeGaye Law Firm P.C., has been recognized by Elite American Lawyers for dedication, achievements, and leadership in corporate law. At the helm of his practice, Mr. LeGaye brings forth an extensive knowledge of corporate, security and business law when consulting with clients regarding capital structure, registration, reporting and regulatory examinations of their firms with FINRA, the SEC, and various state agencies. He also advises clients on the structure and systematic review of supervisory procedures and compliance systems to meet regulatory requirements, prepares contracts and agreements needed by full-service brokers, dealers and investment advisors, and conducts compliance examinations for clients to ensure alignment with all federal, state and self-regulatory organizations. Mr. LeGaye has represented both individuals and businesses in a wide variety of commercial transactions, corporate structuring and regulatory compliance issues. His main focus has been the financial and securities industry, where he has worked closely with institutions, brokers, dealers and investment advisors to ensure they are compliant with applicable laws, rules and regulations. His legal practice includes diverse experience with a broad range of clients in the financial industry including advising clients, including broker-dealer and investment advisory entities regarding their capital structure, registration, reporting and regulations. He became involved in his profession after transitioning into investment banking and securities during the late 1980s as a transactional attorney, and enjoying the challenges of structuring, documenting and implementing transactions, as they enhanced his appreciation of the value of blending legal and business practices. Contact Daniel E. LeGaye, Esq.